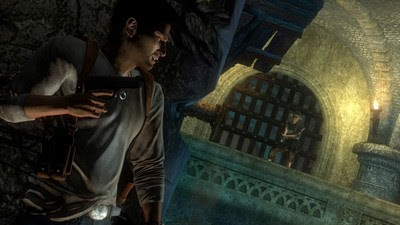 With the recent release of Uncharted 2: Among Thieves blowing people away with its consistency and absolute quality, it's easy to forget that the original game, Drake's Fortune, was also extremely good and consistent throughout. As the first game in the series, it introduced us to a lot of things that are now executed amazingly in the sequel, but more importantly the fact that these were successfully implemented the first time around is a feat that not many other developers can achieve with such subtlety, professionalism and composure. When considered as a whole, the end result is a game that feels concise, cohesive and controlled -- Everything is there for a reason, with very little fluff to be found in the game's 20-odd chapters. Below are just some examples. Right from the get go, our introduction to the main characters reveals subtle yet crucial information that will shape our perception of them in the future. The first and obvious example is Nathan Drake, lead character and the guy the player gets to control for the next 10-15 hours. Within moments of the game beginning, we find out that Nathan is a direct ancestor of Sir Francis Drake and that he, along with Elena whom I'll speak about in a moment, is searching for Sir Francis' coffin at sea. Through dialogue with Elena, we start to form a picture of Drake's personality, revealing that he's quite the confident and cheeky man, interested in finding out about his ancestor but not too surprised when the coffin is found and revealed to be empty. Not too long thereafter, Nate instantly recognises the Pirate threat that is about to intensify things and reacts accordingly. When considered alone, this introductory sequence doesn't imply all that much, but once you've seen the rest of the game you realise that it subtly relays the necessary information to start forming the foundation of the player's perception of Nathan's personality, as well as starts fleshing out a backstory that is open to interpretation. Why is Nathan not more reactive when he finds the coffin empty? Why was he tuned in to the Pirates' presence? And why, aside from family ties, was he searching for information on Sir Francis anyway? It doesn't just happen with Nathan, though; in the short opening sequences we also get a decent picture of whom Elena Fisher is, as well as whom Victor Sullivan is. With Elena, we learn that she's a TV or news reporter whose network has funded an expedition to find Sir Francis' coffin; it was because of her that they -- Nate and Elena -- were able to use a boat to find it. As Nate investigates the coffin, Elena is filming for her project back home, asking questions and expressing a keen interest in the events unfolding. When the pirate threat appears, she's a lot more agitated than Nate is, panicking at the situation but not worrying herself into a frenzy. When Nate asks if she knows how to use a gun, she reluctantly responds with "Yeah, it's like using a camera, you just point and shoot, right?! ", instantly explaining why, when the gameplay begins, she's able to hold her own in the heat of the battle. The difference being that she's doing it because she has to, the tone in her voice showing her reluctance as she prepares to defend herself from a potential death. Nathan on the other hand fights with experience: he is more relaxed, a little arrogant and seems to have no problem with killing handfuls of pirates. This conflicts with his otherwise nice guy demeanor and is something that, for some, is an immersion-breaking sticking point. I'll offer my own thoughts on this issue in my next post. Returning to Elena, throughout the initial chapters we continue to learn more about her, another stand out moment being when she tracks Nathan Drake down after he, along with Sully, abruptly leaves her behind. It was her investigative instincts as a journalist that helps her here, demonstrating at once that she's not one to be put in her place and that she is in this journey for the long haul; ultimately communicating further aspects of her character to the player that will, and does, assist the overall characterisation and experience of the game. Lastly we have Victor Sullivan, an old friend of Nathan Drake's and his partner in crime -- so to speak -- when it comes to pursuing the history of Sir Francis Drake. We first meet Sully as he flies his sea plane, lady decal and all, down to rescue a now stranded Nathan and Elena; as the door opens we are greeted with an old man smoking a cigar and laughing at their predicament. Within seconds, we learn that he's got a penchant for women (as shown by the aforementioned decal on the plane and also by his polite attitude towards Elena as he acts like a gentleman and helps her up, whilst leaving Nate to climb up on his own); has a jovial and relaxed personality and is considerably older than his fellow adventurers. Back ashore and through a conversation with Nathan, we learn that Sully is in it for the money, and we watch as he becomes quite serious once he realises the extent of the information that is learned by Nathan's findings in the coffin; the pair of them quickly ditching Elena in order to continue the search. In the proceeding chapter, Sully is alongside Drake as they explore and it is here that we learn even more. 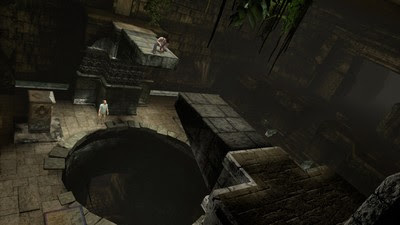 With some light platforming in this chapter, you -- as the player -- hear and see Nathan climbing and jumping with relative ease whilst Sully is grunting, groaning and panting as he follows. At times throughout the chapter, Sully even stops to catch his breath, letting Nate do the hard work to open a door or figure out a puzzle. It may be subtle, but the differences between the two couldn't be more revealing as the game communicates to the player their contrasting personalities, attitudes and, of course, their age. It's the little things like these that make the overall experience of Uncharted: Drake's Fortune more compelling. By including them, we care more about the characters because we are shown aspects of their personality that pique our interest and intrigue us, the end result being a bunch of people we can truly resonate with and a game where it absolutely feels like we are along for the ride with them, as opposed to just watching their story as in other videogames. It's a key difference, and just one reason why the game is so successfully executed. Another is the game's mechanics. 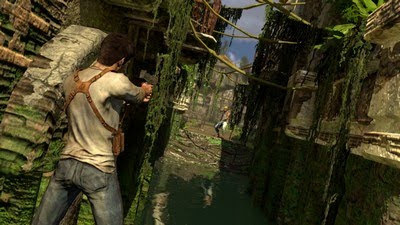 While their influences are obvious -- a cover system seemingly yanked straight out of Gears Of War, and an adventurous style of play that, if replaced with Lara Croft, could easily be considered another Tomb Raider game -- there is no denying that Uncharted's mechanics work, and work well. Seldom is a moment seen where animations clip between Nathan and the objects he uses for cover; echo the sentiment for how, and when, he moves to and from cover to cover -- it all occurs seamlessly and is all the more fluid because of it. With that in mind it's no surprise, then, that right from the beginning of Drake's Fortune we are shown a variety of mechanics that we will then go on to use throughout the game, the impressive thing being that it's all information we need in order to play the game but none of it is introduced in an overbearing manner. Importance over irrelevance -- Naughty Dog sure do have their priorities straight. Examples of this begin instantly, as the pirates attack the boat where we have just met our new-found friends. The initial wave of pirates shoot from afar, opting to stay on their vessels as a means of safety and of distraction -- having a bunch of boats with pirates attacking all at once is surely going to keep Nate and Elena on their toes, perhaps putting them off their game and allowing an easy victory for the pirates -- and it is here that we briefly and, crucially, quickly learn how to take cover, aim, and shoot. Before long, the battle intensifies as more pirates come at the ship from all angles, their occupants quickly jumping off and climbing aboard. It's here that we learn -- again, quickly and briefly -- how to use the game's melee system: ranging from offensive attacks to counter attacks and even a special attack in the form of a Brutal Combo. The important thing to note here is that all of these attacks are taught within seconds, and they are all easy to perform. There's no unnecessary complexity here, just a few easy to remember button combinations that offers some variety whilst also allowing us to get on with things. The final onslaught of enemies brings out the bigger guns, with the pirates attacking the ship with grenade launchers. For a brief moment, we as the player are required to take cover and move around the ship in order to survive before Sully comes to the rescue. It's an intense introduction to the game but despite the action, it manages to cover exactly what it needs to in a pedagogical sense, teaching us what we need to know and nothing more. In the subsequent chapters, particularly the next one with Nathan and Sully, we're shown the game's other main mechanic: the platforming. 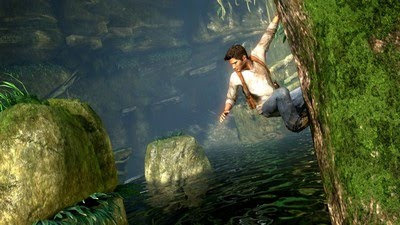 Again, Naughty Dog have kept it simple with only a couple of buttons covering the corresponding actions required: X to jump and generally climb upwards, leaving Circle to do the direct opposite by allowing Nate to drop down from a ledge. The game's context sensitive design takes care of the rest, allowing for some guided but accessible platforming that engages the player but rarely, if ever, frustrates them. We also see a few quick-time mechanics that aren't really all that quick. In one particular moment, Nate has climbed and jumped across a few ledges in order to reach a boulder which he then has to push off to open the way forward. A few presses of the Circle button (I think, it could be the Triangle button -- my memory is a little hazy) later and Nathan and Sully are able to continue onwards. This simple moment shows us there will be similar occasions in the future, but that they're not bothersome and don't hinder our progress like implementations in other games might do so. All in all, the introduction to Uncharted: Drake's Fortune's mechanics is done quickly, but crucially, it is done effectively as well. There's no rubbish here, just an emphasis on form and function that a lot of other games would do well to incorporate into their own structure. 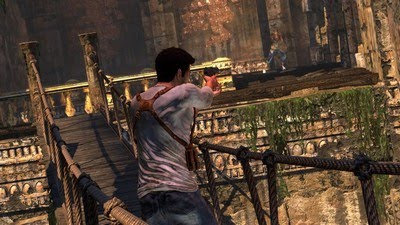 Naughty Dog does what needs to be done, but none of it wastes the player's time, and that is a critical component to the engagement of the player. The mechanics and narrative are not the only things considered throughout the opening act of the game. 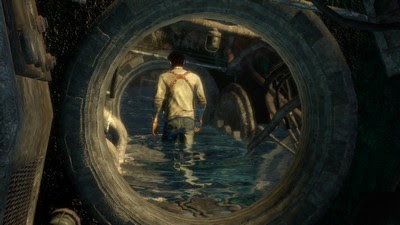 Others, like the gorgeous graphics (example: texture work of the coral and sea shells covering the bottom of Sir Francis Drake's empty coffin) and beautiful locations (example: the camera panning over the lush jungle setting as we hear Elena on the dock speaking into a phone, with Nathan and Sully inside a boat discussing their findings) are subtly yet effectively introduced to us, amazing us with their incredible attention to detail and immersing us further into the game. This continues as we see Nathan and Sully walk through some water in the second chapter, their clothes suitably drenched and, interestingly enough, accurately reflected based on how deep they have waded. Birds sing in the trees; lizards scamper as the guys get closer; and conversations are had as observations and jokes are made, revealing even more information about our protagonist and his allies. It all culminates in an accessible, engaging experience that, if you can't half tell, I absolutely loved, and now that Uncharted 2: Among Thieves has shown us how Naughty Dog have pretty much perfected their formula, I thought it was fitting to direct your attention to the original game to show you where it all began. I think it's safe to say that the Uncharted series as a whole, wherever it leads to next, is where Naughty Dog have finally shown us just how talented they really are, and for that alone they deserve our respect, but the series isn't perfect and in my next post I'll discuss some of the concerns many have shared over the past two years about Uncharted: Drake's Fortune. Please, do come and join me. Nice post, Steven! Having just played through the game myself in anticipation of really getting the most out of the sequel, I gotta say, I really agree with you. Some aspects of the gameplay feel a little bit dated now - particularly the somewhat floaty gunplay and the just so slightly inconsistent cover system - but danged if it wasn't a really complete, well-made game. As Mitch Krpata pointed out in a great post called The Minimalism of Uncharted 2, Naughty Dog does a great job at streamlining their game and cutting out any unnecessary bits. I noticed this particularly in how Uncharted 1 handles guns and ammo. You're constantly low on bullets, and switching in mid-firefight to whatever primary gun has been left lying around becomes a necessity. When the zombie monster Spaniards show up, the game really became survival horror, with me sweating the crap out of making it to the next checkpoint and trying my damnedest to conserve ammo. All in all a really great game. The only thing it didn't have enough of were sequences like the one, early on, in which a scaffolding under Drake begins to collapse, and he's forced to run towards the camera to escape the crushing rocks. It was just Bang-up, and I wished I'd gotten more of it. From what I've seen, the sequel packs these moments in by the bucketfull, and that's one more reason I'll be watching the mail with bated breath this week. Kirk -- Yeah, those moments you mention happen a bit more in Uncharted 2, which is yet another way in which Naughty Dog can keep the player engaged. By providing this variety the mechanics overall never get boring or tedious, which is nice and explains why the sequel is receiving such high praise for its fantastic pacing. I find it amusing that you bring up the lack of ammo and the improvisation with the game's weapons. I'll be discussing this element of the game in an upcoming post, so yeah I found it a little funny that you also brought it up. Thanks for stopping by Kirk, it's appreciated. Here's hoping you enjoy Uncharted 2: Among Thieves as much as the rest of us have.